Enter the size of the area you are going to apply your vinyl lettering on, and then click on "Customize It". You will then be able to put as much lettering and graphics in your design as you want. We have a wide selection of colors which can be viewed online. We can also special order unique colors upon your request (additional charges will apply). Due to the differences in display technology at each end, it is not possible to get a consistent menu of colors broadcast throughout the World Wide Web. There will be some variation in the colors displayed on your monitor from they way they look on ours. If you are in a situation that an exact match is required, the only way to guarantee that you (the customer) will know the exact color your decals will be is for us to send you a color sample for your selection. We will be happy to do this for you at no charge. Our Vinyl decals carry a 1-year guarantee. This covers peeling, cracking, and fading. Since our product is made to order, all sales are final, with the exception of warranty problems, which we will happily replace with a duplicate product within the 1 year warranty period. We do not issue cash refunds. Returns will not be accepted without a written authorization. Custom work is not returnable. A 30% re-stocking fee will apply to all returns. 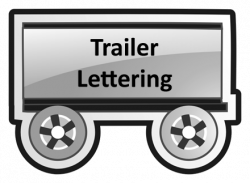 Please click here in order to see our photo gallery of Trailer Signage & Lettering.